Ideal for artist and crafters! This sturdy basin is divided into three compartments for soaking, scrubbing and rinsing. One side has two compartments with a brush rest for soaking and rinsing brushes. The other has a grid in the bottom for gently removing stubborn paint from brush bristles. Mont Marte 96 Hole Plastic Pencil & Brush Holder for Paint Brushes, Pencils, Markers, Pens and Modeling Tools. Provides Excellent Art Studio Organization. 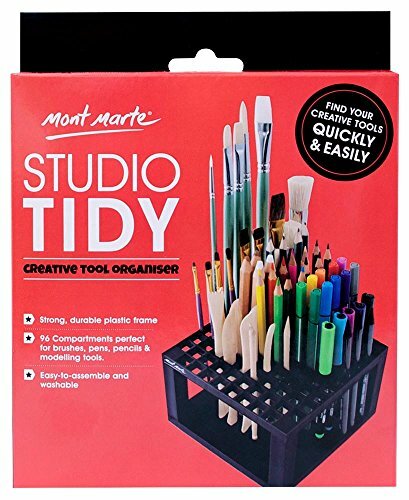 Art studio organization has never been easier thanks to the Mont Marte Studio Tidy. This strong and durable desk tidy helps keep your space tidy and your art tools in easy reach. Featuring 96 compartments for brushes, pencils, pens, markers and modelling tools, you'll love how easy it is to transform your space with this art studio organization tool. The simple and highly practical grid structure of this desk tidy can fit a range of tool sizes. Whether you need a paint brush holder or a place to put other tools, it has you covered. The durable plastic frame is easy to assemble and washable for hassle-free use. Make art studio organization simple with the Mont Marte Studio Tidy. Paint brushes are expensive! Protect and store your brushes in the Artbin Brush Box. This plastic storage container has vented sides for quick drying and foam inserts to secure and protect brushes. Protect and store brushes in this storage box with vented sides for quick drying. Foam inserts securely hold brushes in place protecting bristles from damage . Holds brushes up to 14 in length. This professional paint brush basin is a convenient and functional tool for painter. It features a place for brushes, paint and water, and a lid that doubles as a mixing palette. It is made of high quality material, both portable and durable. It will be an excellent companion for artists, kids and decorative painters. Everyone wants to have this useful brush basin, order a useful painting brush basin today! And you'll have more fun with this brush basin. 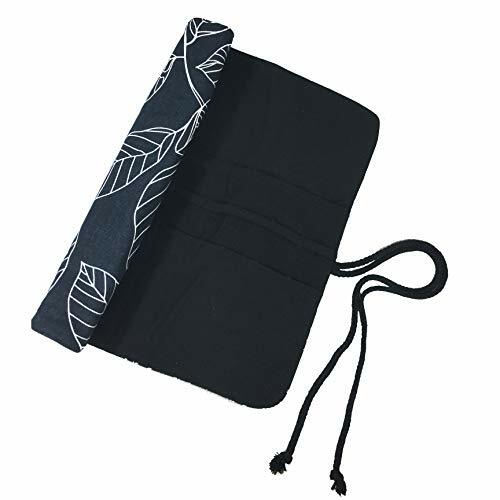 This item is made of durable canvas. It has separate pouches to store your painting brushes. Besides, roll up design makes it easy to carry wherever you go! Great for beginners, kids, and professionals. 1.Durable: made of high quality army green canvas. 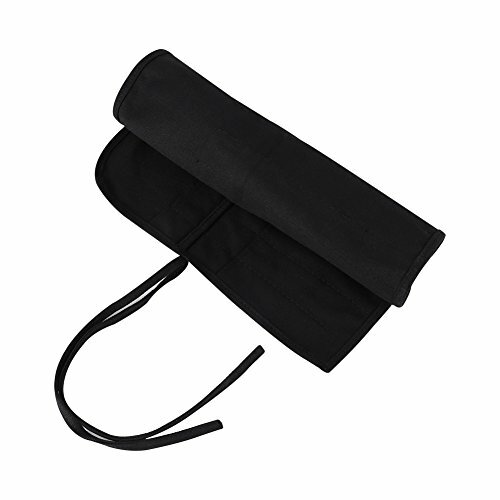 2.Convenient: simply roll up, and tie, easy to carry. 3.Use for install painting brushes, tidy accommodated. 4.Double-row pen holes, can hold more paintbrushs as you need. Features 22 brush pockets in two lines. Capacity: There are 20+2 individual spots two layers for brushes of all shapes and sizes. Each slot has space for 2 brushes. One slot is quite a bit larger for any bigger brushes. 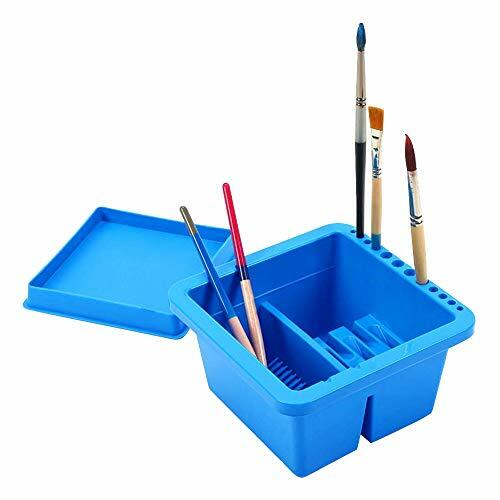 Keeps your brushes and other painting supplies well organized, it can hold pencils, BiC pens, fountain pen, ruler, highlighter, scraper, utility knife & paintbrush, etc. The perfect way to keep your art brushes, markers, pens and pencils organized and neat. No More wasted time finding your drawing utensils in a drawer. As artists and elementary art educators, at Homegrown Artist we love great organization tools for children, teachers and students in the classroom at school. Every child artist needs special containers to display their pro creative kit, ready when you have the urge to create; coloring, drawing, or whipping up paintings. With 49 holes this paint brush caddy has room for a fair supply of art materials! Care for your art making paint brushes with this cute utility crate. Simply wash out your brush when you're done painting (don t let the paint dry out! ), gently mold the bristles back into shape while they are still wet, and always store your brushes upright in the Homegrown Artist Tool Stand (not on their heads!) 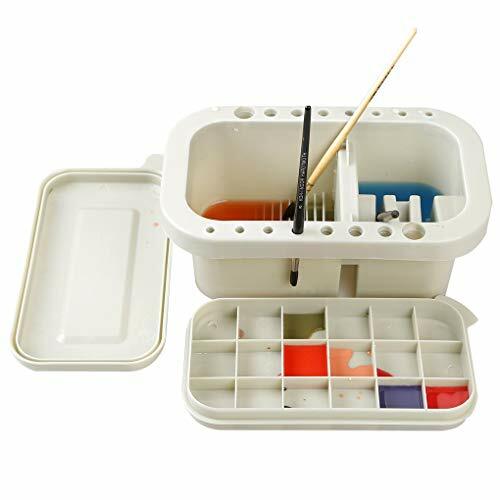 Great for storing watercolor, acrylic, oil, Chinese and Japanese brushes. We tested this paint brush holder in our art studio, AND our students tested it in the art room and we LOVE how it helps to organize our creative spaces, and keeps our brushes looking good. We are sure you will love it too! Add it to your cart now and get busy creating!  KEEP ALL YOUR ART TOOLS IN ONE PLACE - Never lose your favorite art or craft tool again! 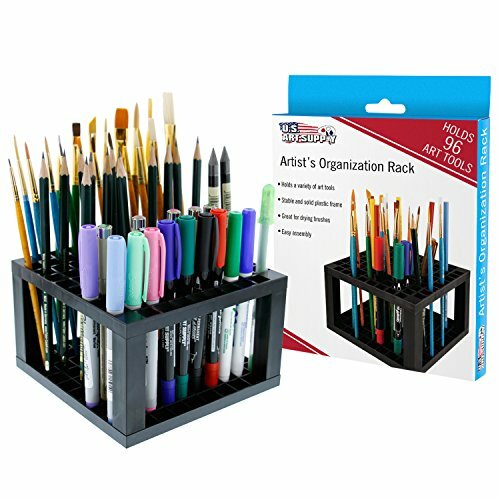 A great craft tool organizer, this multi holed storage bin also holds all your artist accessories safely together. With 49 holes, find everything quickly and easily when you next create something special. 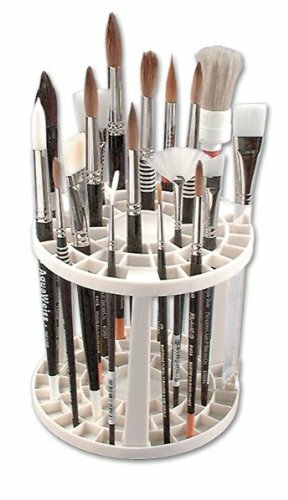  NO MORE MESSED UP PAINTBRUSH TIPS - Keep bristles protected in this paint brush stand, a perfect vertical storage rack for standing paintbrushes upright. 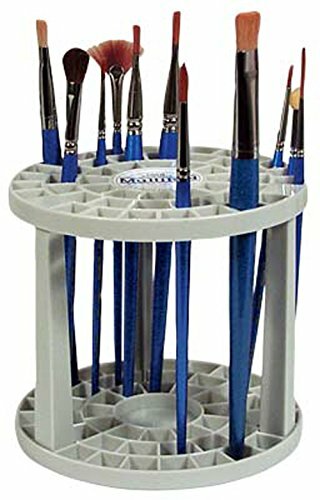 Homegrown Artist's paint brush organizer remains stable while storing long handled brushes too!  EASY TO ASSEMBLE, EASY TO MOVE - Quality made, these sturdy & stable paint brush holders won't fall apart once assembled, even if you move them! The design of the paint brush holder organizer means it's easy to disassemble, making it mobile & portable for travel.  HAVE MORE ROOM TO CREATE - As an artistic kid, you need loads of room on your desk or counter to create. A special art supplies organizer to store your hobby supplies keeps them out of the way (and not rolling off the table!) giving you plenty of room to whip up your next masterpiece!  LOOK LIKE A PROFESSIONAL ARTIST - Proudly keep your art tools on display in this artist tool stand, and have your creative space looking like a pro artist studio! The milky-white color of the round plastic stand will perfectly enhance your colorful pen, pencil, marker and paintbrush collection. This Brush Grip brush holder from Easy to Use Products is like having a third hand to hold your brushes while you paint. If you want to switch between different loaded brushes, Brush Grip can help by holding up to 8 paint brushes at the same time. Its finger grip brush handles securely, but not so strongly that they are hard to pull back out again. Brush Grip easily attaches easily to any easel or stand by one of the two mounting methods included in the box. You can either use the rubber strap or the Velcro to fasten the Brush Grip in a convenient spot. 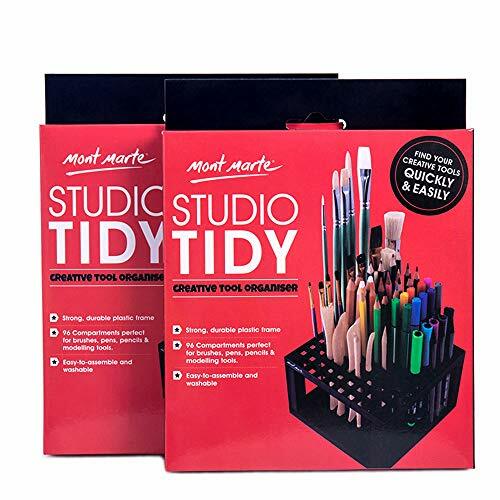 Mont Marte Studio Tidy 2 Pack. 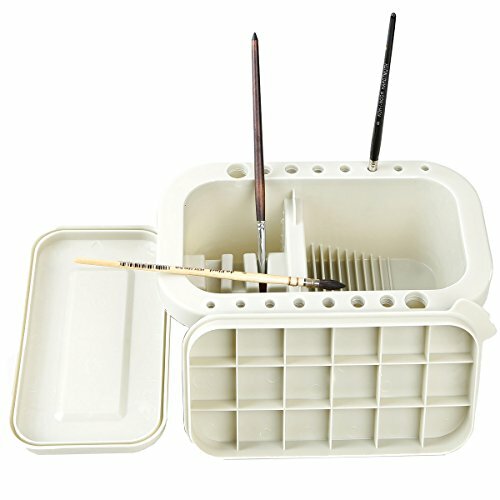 96 Hole Plastic Pencil & Brush Holder for Paint Brushes, Pencils, Markers, Pens and Modeling Tools. Provides Excellent Art Studio Organization. It holds all your paint brushes, color pencils, pens, crayons, watercolor brushes, makers, blend stumps, anything that fits in. Package size: 6.5" x 7.08" x0.72"
Standing Size: length-5.7"x width- 5.7" x height- 3.46"
Easy to assemble or disassemble, easy to transport. Be noted: Any brushes, pens, pencils, markers are not included in the package. 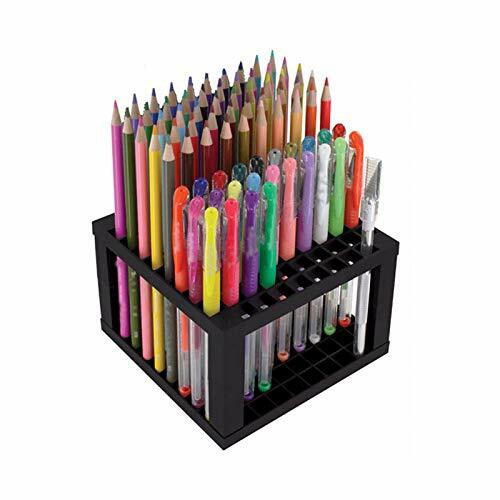 Plastic pencil and marker holder desk caddy with 96 slots. It can hold general pens, markers, pencils, art paint brushes, crayon , blending stump, anything that fits in. Keep your desk organized. 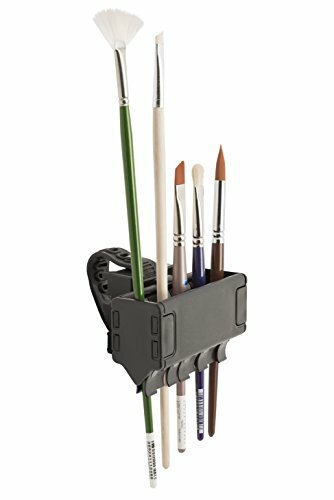 This paint brush holder put all your pens, art brushes, drawing pencils and other art or stationery tools will be stored and sorted in place. No more mess of your tabletop. Easy to assemble and disassemble. Fit all bars into the 4 slots to simply assemble, no wobbling! Durable plastic, proper size on desk, portable to transport, 96 holes for plenty of your storage for your brushes, pens, markers, pencils, crayons and more. 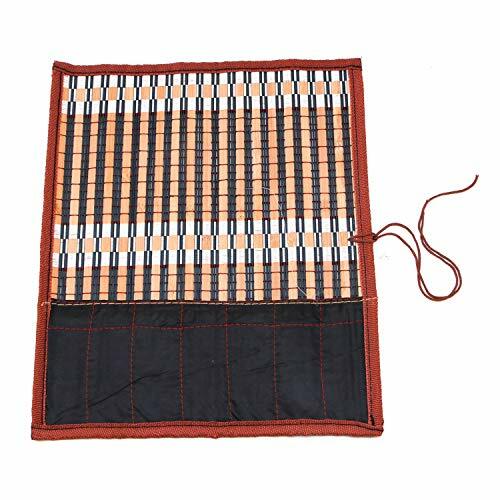 Standing Size: length-14.5cm(5.7) x width-14.5cm(5.7) x height-8.8cm(3.46) Holds lots of your stuff but occupies only a small space on your desktop. This airtight brush washer features sturdy construction and will help you store and transport turps and mineral spirits safely. 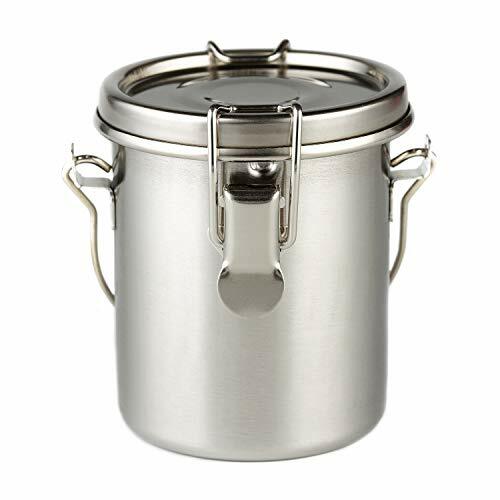 It features a silver finish and includes a strainer. It is perfect for using in your studio or the classroom. Make brush cleaning easy with the Mont Marte Twin Compartment Plastic Brush Washer. This handy brush cleaner and dryer is an invaluable accessory for artists. It features two compartments for cleaning and 12 holes with 6 different sizes on the rim for holding brushes upright to dry. For through cleaning, one of the compartments in this brush washer has a ribbed section that helps remove paint from your brushes. The other compartment features slanted grooves that allow you to rest your brushes in water while working to prevent them from drying out. This brush cleaner and dryer also comes with a lid that can double as a paint palette. 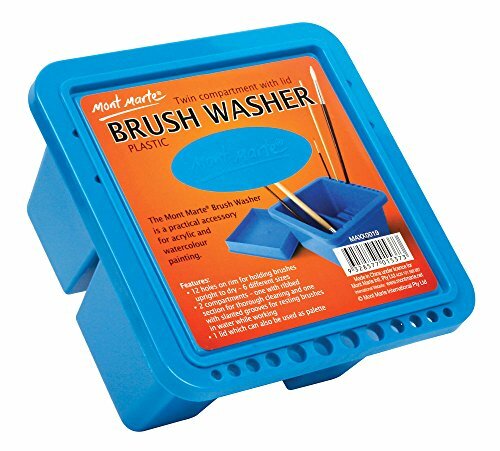 The Mont Marte Twin Compartment Plastic Brush Washer is the perfect, hassle-free cleaning solution for artists. 96 Hole design, Easy to assemble, convenient to use, keep your desktop more neat. Easy to stay organized and efficient when all items are stored in a slot. Great for brushes, pens, markers, crayons and more. 3.96 holes pens holder desk stand consists of three parts: a top, a bottom and four pillars. All parts are made of black sturdy plastic. Made of bamboo in exquisite carft. Size: 12.6'' x 10'' / 32cm x 25.5cm. Impactful and portable, convenient for carry. 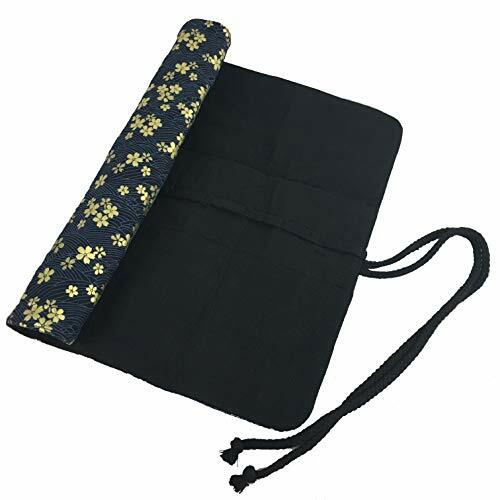 Good for protecting calligraphy brushes from damage when carry them on the way. Combined size is 14.5 x 14.5 x 9 cm/ 5.7 x 5.7 x 3.54 inches. 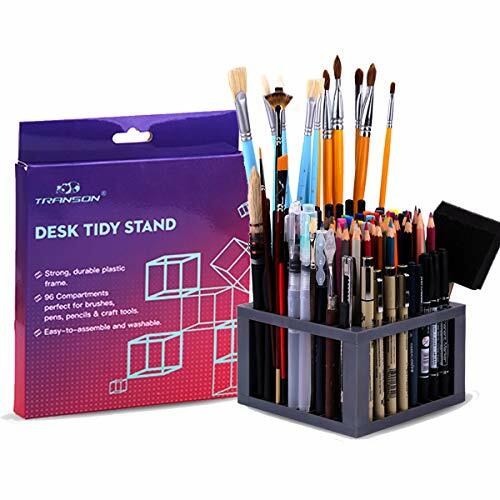 Each brush stand has 96 holes holes, enough to keep your brushes, pencils and other art and craft tools organized, makes your workspace look neat and organized. Visibility makes it easy to locate the right brush or tool. The brush holder keeps brushes apart and less cluttered to prevent contamination and mess either for cosmetics or for painting. This is made of black plastic which is durable to use for long time. Easy to assemble, just insert 4 columns into top and bottom square plate. Good for artists, painters, students, teachers, parents and more, set this up where you paint or work, making it easy to select your brushes. 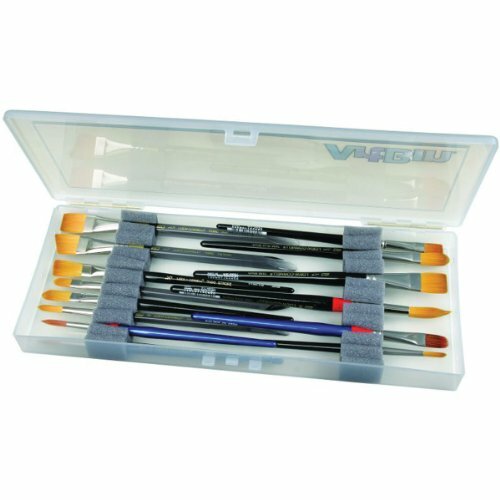 Keeps artist brushes, art tools, pottery tools and makeup brushes organized and accessible. [ Well organized ] - Keep your markers, pen/pencils, brushes organized and sorted in one place. The brush holder keeps brushes apart and less cluttered to prevent contamination and mess either for cosmetics or for painting.. Perfect for other small painting tools as well. [ Handy acquired ] - Organize and sort your drawing tools in one small gadget, your pen/pencils are always nearly acquirable on desk. No longer have to waste the time on looking for specific pens in a case. [ Upgraded DIY square paint brush holder ] - Each brush stand with 96 holes, enough to keep your brushes, pencils and other art and craft tools organized. 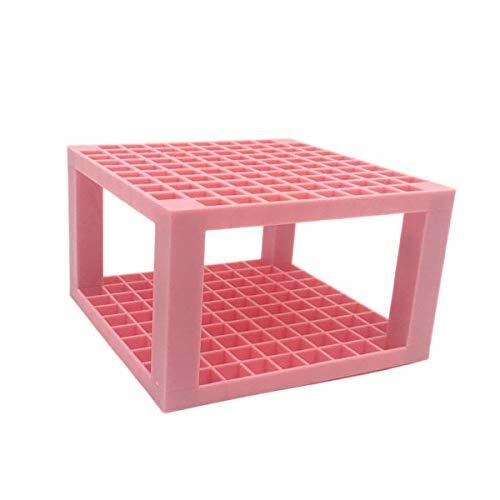 You will receive up-down square plate and 4 columns, combined size is 14.5 x 14.5 x 9 cm/ 5.7 x 5.7 x 3.54 inches. Each part was accurate tested, you can definitely install them into a very durable and stable holder. 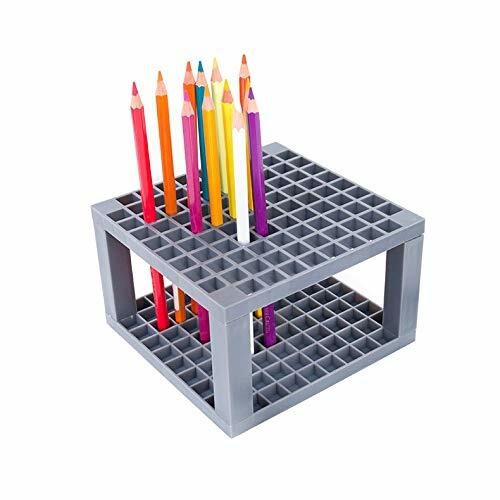 [ Durable structure ] - Durable and strong plastic frame keeps the pencil holder in stable construction with good quality. Almost ready-to-work, easily assemble structure makes you to finish the installation in no time. 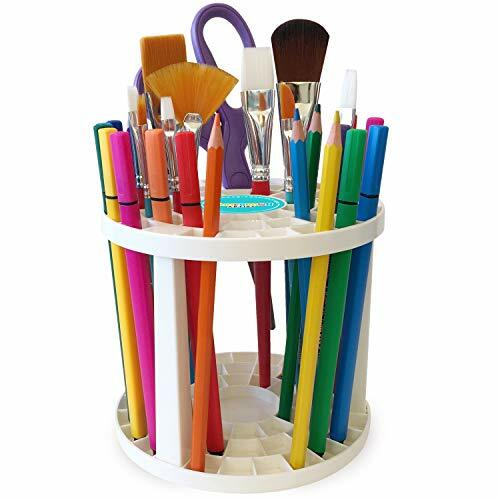 This Brush stand is made of plastic which is durable to use for long time. Easy to assemble, just insert 4 columns into top and bottom square plate. 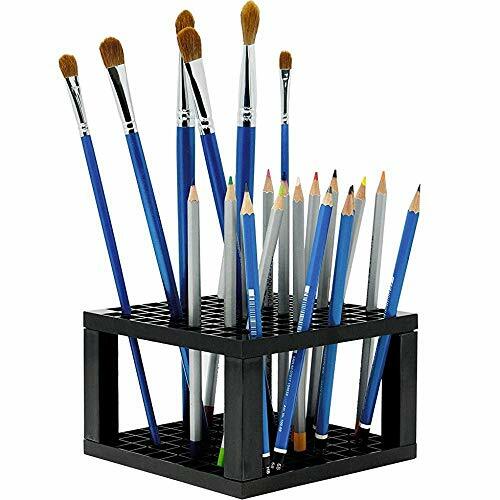 This brush stand has 96 holes holes, enough to keep your brushes, pencils and other art and craft tools organized, makes your workspace look neat and organized.Combined size: 14.5 x 14.5 x 9 cm/ 5.7 x 5.7 x 3.54 inches Visibility makes it easy to locate the right brush or tool. The brush holder keeps brushes apart and less cluttered to prevent contamination and mess either for cosmetics or for painting. Compact and lightweight, convenient to carry.The Brush pen can be immersed in the pen washing water, wash thoroughly. Keeps brushes, paint and supplies clean and organized. 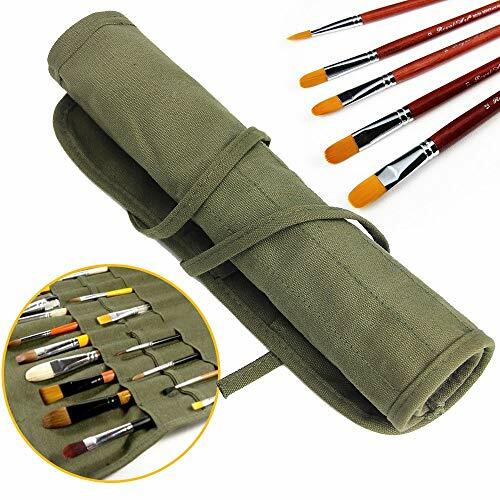 Total of 22 different size grids, you can put the brush, scraper, utility knife and other painting supplies, so that the paintbrush is no longer mess. Double - row pen hole, can accommodate more paintbrush. With smooth snap design for easy access and security of your art, school or office supplies. Made of high quality canvas material, canvas fabric solid, and durable. Use for painting brushes, tidy accommodated, can be rolled up, easy to carry. It is a great gift for children, student, friend, art hobbyists, and artist.